It’s now all glued together and I need to sew it next and then quilt it! It’s only taken a couple of days to turn the edges under and glue. The background is Modern Meadow by Joel Dewberry and I think it looks great. I should probably get back to making my curtains soon now that’s sort of out of my system. And this stack came through the post yesterday, just after I wrote I’m expecting my last few fabric packages before Christmas and not ordering anything else. I was lucky enough to win a $50 gift voucher for Abbi Mays from the Pets on Quilts competition on Lilypad Quilting and this is what I bought! 6x 1m cuts of Keiki Oops a Daisy from Moda. I only ordered Friday 17th from the US and they arrived in the UK on Tuesday 21st! AMAZING! Previous post Swap Mini Quilt finished! ohh I love the perspective of Giant George – very interesting – you said it was all glued – is it just temp fabric glue or did you fuse him? are the edges turned under or are you going to sew them down? 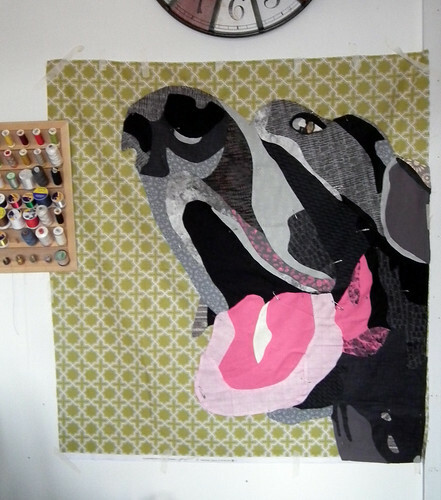 Hi Nina-Marie, it’s all glued with glue stick for now with all of the edges turned under. It’s just temporary until I sew them together but it’s a handy way to keep the pieces in the right places and the edges underneath. Giant George is wonderful! Great fabric purchase with your winnings. George is gorgeous! You got some pretty fabrics, there! Wow that quilt is amazing! Great job! the giant george is amazing! well done! my mom would love her dog immortalized like that. Love giant george, it’s a piece of art!! 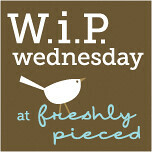 Thanks for linking up with WIP Wednesday. Oh my goodness, George is wonderful! Amazing work!